Baseball Mogul 2007 Game Review - Download and Play Free Version! Experience what it is like to run a real Major League Baseball team! In Baseball Mogul 2007, you assume the role of both General Manager and Manager for a Major League team of your choice. You start on Opening Day of any year you choose (from 1900-2006) with complete rosters and minor league prospects. In your role as Manager, you set the starting defense, batting order and pitching rotation for your team. You choose who stays in the big leagues, who gets sent down to the minors, and who gets released altogether. As General Manager, you craft complex trades and sign multi-million dollar players, competing with artificially intelligent player agents and general managers. You also get to control all the finances of your team, from setting the price of a ticket to allocating funds to your farm system, scouts and medical staff. Although you must successfully juggle the financial aspects of your team in order to succeed, your Mogul Rating is based entirely on your team's performance on the field. And unlike some baseball sims, you can switch to player mode and control individual pitches and batting choices if you want to get that detailed. As General Manger of your team you must manage all the finances for your ball club, making sure that the team doesn't go bankrupt. Raise revenue for your team by setting the price of tickets and concessions, and selling the TV broadcast rights, while you manage your team's expenses by setting the budget for your farm system, player scouts, medical staff, and player payroll. But be careful, because fans can be fickle if your team doesn't win or if your tickets become too expensive! If you don't succeed in your first year, you get a new chance with Baseball Mogul 2007's in-depth amateur draft. You pick and choose from the best high school and college talent around the world. If your new players are good enough, have them join your team right away, otherwise send them to your minor league franchise for training and improvement. Your involvement as GM does not stop in the team's front office. Baseball Mogul 2007 gives you complete control over your team on the field. You start by setting the starting defense, batting order and pitching rotation for your team. On game day, you choose your level of involvement. You can retire to the luxury box and make calls to the dugout as needed. Or you can take control of each player, choosing what pitches to throw and when to bunt or go for an extra base. A powerful game engine simulates each pitch of the game based on customized player ratings and over 100 years of historical data, assuring you the maximum realism possible! 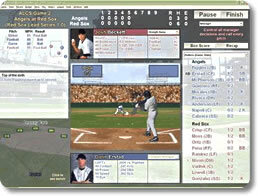 Baseball Mogul 2007 is designed to help you manage your team over many simulated years. Manage your team one day at a time, or let the computer simulate weeks or months at a stretch so you can play for virtual years or decades. As your players age, their abilities mature and decline realistically. Don't forget to build your team for the long term, rather than spending all your money on free agents this season. Watch your team rise and fall in the standings, watch your bank statement, and read the news stories to stay on top of what's happening with all the ball clubs in both leagues. If you pick the right players, manage your finances well, and stick to a winning strategy, your team may win the World Series and you too may become the ultimate Baseball Mogul! Historical Rookies! Start in any historical season. Baseball mogul will then include minor and major league players for all teams. Players personalities and Morale! Manage individual personalities of your team to build the right team chemistry. Expanded Contract Negotiations! Arbitration, free agency. Use player options and no-trade clauses to sweeten deals and land the best players. Minor League System! Manage up to 100 players in your farm system. From draft day until retirement. Track players using new reports and stats. Updated Rosters! Detailed career stats for over 10,000 players. Baseball Mogul 2007 isn't for the casual console baseball player looking for action. This game is for the baseball diehard, the fantasy baseball player, and fan who wants details, stats, and control. If that is you, give the free download a try on your PC today and experience what it is like to run a real team! Baseball Mogul 2007 puts you in total control of a Major League baseball team. You manage everything from ticket prices to player lineups in this detailed and realistic baseball simulation. You have an unbelievable amount of information and statistics to guide you along the way. This game also brings a much more robust and interactive play-by-play mode than past games in the series, letting you take part in the action. Select Year, Team, City, etc. You start the game by selecting the year you want to start in. The year you pick determines the statistics that will be used to simulate games. After you've selected a year, you can select which city you want the team to play in, the name of your team, the name of your mogul, the level of difficulty, and a number of other options to make the game easier or harder. Once you've selected all the options and advance, you'll begin your first season in the year you selected. You can play anywhere from one day to multiple seasons, and any games during that time period are simulated. You'll play through the whole season eventually, and then deal with resigning players and drafting new players. Then you begin a new season and start the whole process over. One great aspect of the game is the level of control you have over your team. You are in control of things like ticket prices, concession prices, and even the type of broadcast for your game. You can make trades, change lineups, and release players. You get to manage expenses and determine how much you're willing to spend on players. It gives you a lot of control and input on how your team is run and the level of success you'll have. Another great feature is the play-by-play mode. This mode has been revamped and improved from previous versions of the game, giving you even more control over your team. Text outlines each play (such as a player grounding to first base), while very simple animations give a visual indication of the play result. You can watch the games play out without your input, or act as a manager and make substitutions or play calls. You even have the option to act as a player and throw pitches or bat. It adds some action and excitement to the game and gives you more control and influence on your team's success (if you don't want to just simulate games). 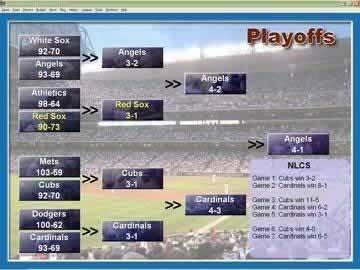 Baseball Mogul 2007 gives you several choices that let you adjust the difficulty level of the game to something more suitable for your skill level. The game also provides options that can make the game easier by removing some random elements or making players develop in a more consistent way. At the same time, the sheer amount of control and information you have creates a lot of complexity. This complexity can make for a quite a challenge, regardless of the difficulty level you choose. It also limits the audience of the game to people who are absolutely crazy about baseball and/or those who like the management aspects. Other players wouldn't get much enjoyment or success from their efforts. In contrast to the complex nature of the gameplay, the controls in Baseball Mogul 2007 are fairly simple. Everything can be done via pointing and clicking with the mouse, or keyboard shortcuts. A hefty menu provides all of the information and options that you can access. Who Needs Cutting Edge Graphics? The presentation in the game is very simple and limited. The user interface is fairly straightforward and easy to navigate, and looks good as well. There's very little sound, and there's very few graphics considering that most information is text. However, they have been improved compared to past games in the series, with play-by-play mode offering some simple animations and sounds to add to the fun. Despite the limited nature of the visuals and audio, it doesn't really detract from the gameplay. Baseball Mogul 2007 is a realistic simulation game that's going to have a very small audience. It's good at what it does, but not all players will find a lot of fun or success in a game of this type. You've got an incredible amount of information and control at your disposal to help you make decisions. You get to manage finances and your players in your efforts to win games and the World Series. The play-by-play mode adds action and even more control that lets you watch games or take them over. This game is well worth the time to at least download and try if you enjoy the sport of baseball.